Ahmed HG. Impact of Implementing Grading Fine Needle Aspiration Cytology in Diagnosis of Breast Cancer amongst Sudanese Women. Oman Med J 2011 March; 26(2):99-103. On the other hand, most of these cases present with late stages of the disease. In view of that, the implementation of simple, less invasive and inexpensive dealings is important for early detection and planning for an appropriate treatment of the disease. Clinical examination and mammography alone or together do not identify all malignant breast lesions. Because of this, in order not to miss malignancy, all solid breast lesions require microscopic diagnosis. Open biopsy is the most sensitive diagnostic technique, but it is less desirable because approximately 20-25% of clinically suspicious prove to be malignant on histology.3 This means that about 75% of the biopsies performed for benign lesions. Therefore, the application of less invasive, quick and cheap technique is very consequential, particularly in a country like the Sudan, where many patients present from remote areas with poor health services. For that reason, the incidence and mortality of breast cancer are high, remarkably constant and the frequency is increasing, particularly amongst younger women. This study evaluated the possibility of introducing a new system (GFNAC) for the diagnosis of palpable breast lumps, as a preoperative diagnostic tool, and to compare it to CFNAC. The findings of this new system (GFNAC) were compared to histopathology of the gold standard. All cytological smears were investigated adopting two examination systems (CFNAC to detect malignant features and GFNAC to assess the degree of cytological atypia). The criteria for the ascertainment and assessment of the degree of cytological atypia were adopted from those previously reported by Ahmed et al. (2003).7 The criteria of atypia included the presence of the major malignant features including; nuclear enlargement associated with increased nuclear cytoplasmic ratio, hyperchromatism, chromatin clumping with moderately prominent nucleolation and irregular nuclear borders, bi or multinuclation, and scantiness of the cytoplasm and variations in size and/or shape of the cells and nuclei. If only one atypical characteristic is apparent in 3-15% of the cells, the grade is considered as slight, and are further given the following score values for each one characteristic: (+) for 3-6% atypical cells; (++) for 7-10% atypical cells; and (+++) for 11- 15% atypical cells. The score value (+++) is comparable to marked changes scoring (+), which is equal to mild cytological atypia. a) If atypical feature for one characteristic was found in 16-20% of the cells, the scoring is assigned (+), which is equal to mild cytological atypia, b) In 21-50% of atypical cells, the scoring is assigned (++), which is equal to moderate cytological atypia, and c) In over 51% of cells atypia, the scoring is assigned (+++), which is often showing severe cytological atypia. No cytological atypia was considered unless the slight features scored (+++). Scores of different characteristics were eventually gathered to identify the degree of atypia. 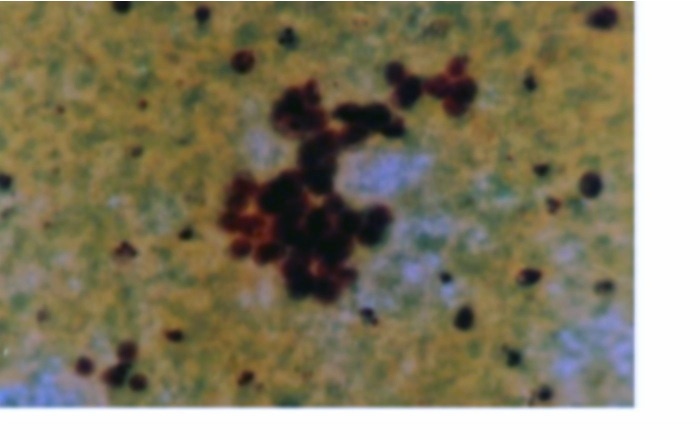 One of three degrees of cytological atypia was reported; mild, moderate or severe. 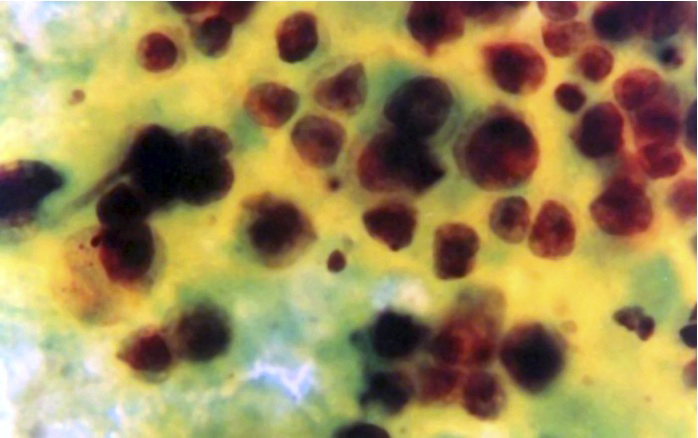 Severe cytological atypia is equal to malignancy. Each participant was asked to sign a written ethical consent during the interview, before the specimen was taken. All specimens were taken as part of the specimens required for diagnosis. The informed ethical consent form was designed and passed by the ethical committee of the Faculty of Medical Laboratory Research Board, University of Khartoum. As histopathology is a gold standard, two independent examiners histopathologically investigated sections from 75 patients with breast lesions, their age ranging from 20 to 75 years with a mean age of 40 years. Forty patients were reported as having breast cancer by two investigators and the remaining 35 were diagnosed with different benign conditions. Figure 1: Ductal carcinoma of the breast: The smear is cellular, cell are dissociated and overlapping, nusclear cytoplasmic ration is high, nuclei are hyperchromatic (Papaniclaoustain, A.X200 and B.X400). 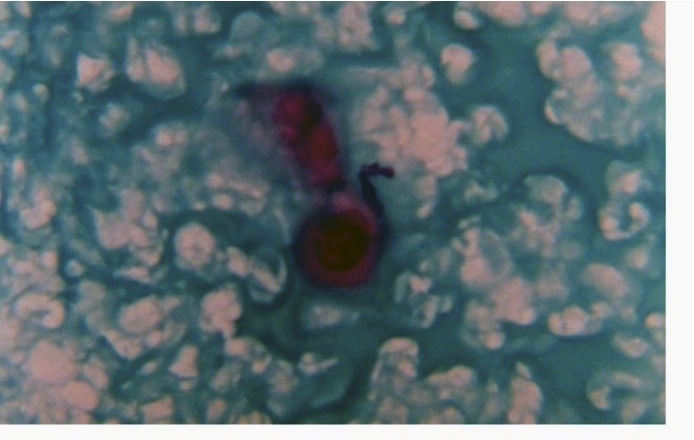 Figure 2: FNA of the breast: severely altered galactophoruos cells surrounded by a clearly hemorrhagic background substance. 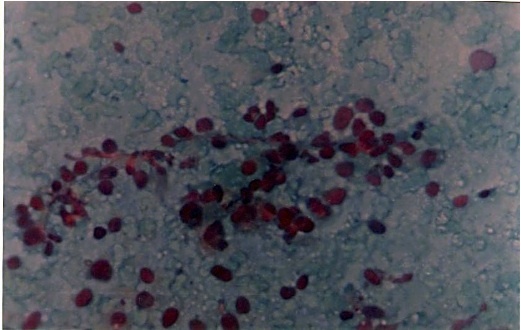 The smear is corresponding to an Intraductal Carcinom (Papaniclaoustain, A.X200 and B.X400). With regard to GFNAC, of the 40 positive specimens by histopathology, 28 (70%) were detected with severe cytological atypia (corresponding to malignant change) by GFNAC, and the remaining 12 (30%) were found to be negative. The negative smears by GFNAC were further categorized as: two (5%) showing moderate atypia (parallel to suspicious), three (7.5%) characterizing mild atypia and the remaining seven (17.5%) were normal. On the other hand, all of the 35 (100%) patients who were diagnosed with benign breast lumps by histopathology were found to be normal by GFNAC (though, 5 (14.3%) revealed mild atypical changes), as shown in Table 1. These findings exposed Specificity of 94.3% and 100% in addition to sensitivity of 87.5%, 70% credited for CFNAC and GFNAC systems, respectively. In comparison of the FNAC results by the two examination systems (CFNAC and GFNAC); the two systems agreed in 27 (96.4%) specimens of the total 28 (100%) positive results by GFNAC. They similarly agreed in 37(96.4%) of the 38 (96.4%) negative diagnosis by FNAC. Cancer continues to be the most feared disease that worries societies worldwide, and the current data ensures the increasing importance of the issue in the coming years. Despite the increasing technology in diagnostic medicine, the wide array of laboratory methods and sophisticated imaging techniques, biopsy interpretation is still the most vital, the most accurate and the most precise method on which the final diagnosis of cancer depends. This study deliberated the possibility of applying GFNAC in diagnosis of breast lesions, as compared to CFNAC in terms of specificity and sensitivity using histopathology. With regard to the 5 (12.5%) cancer patients, who were found negative by CFNAC, unlike histopathology wherein tissue pattern, cell morphology, intracellular products and intracellular matrix are preserved, in cytology it is mainly cell morphology which is preserved. Though, GFNAC showed superior specificity but produced a low sensitivity, and as the assessment depend mostly on the nuclear features of malignancy, the high false negative findings 12 (30%) were expected. This system depends on certain criteria, which ignores some important feature for the diagnosis of breast cancer. In breast CFNAC, the cellularity of the smear, lack of cohesion between the cells and absence of myoepithelium are at least as important features of malignancy as the nuclear atypia itself. This in addition to the fact that the system is rather complicated and time consuming, though, the combined use of both systems may supports the accuracy of reporting. Therefore, these facts provide some sort of limitation to the applicability of this system in routine cytopathology reporting. However, GFNAC can be used to predict the degree of atypical changes in specimens diagnosed as suspicious of negative by CFNAC. Otherwise, the GFNAC might be more applicable in exfoliative cytology than in Aspiration cytology. Overall, the results of this study suggest that, GFNAC system, with its employment restricted to exfoliative cytology, it cannot be a substitute for CFAC in the cytodiagnosis of breast lumps, though it has a high sensitivity; but due to its low sensitivity and complexity. Although, GFNAC is complicated and has low sensitivity, it supplements the accuracy of CFNAC and weight the benign breast lumps in term of cytological atypia. We would like to thank to Fathia Eltyb at the Department of Histopathology and Cytology, Faculty of Medical Laboratory science, Alazhri University for her help and assistance. The author has no connection with any company and the work was supported by author and University of Khartoum. 1. Daltrey IR, Lewis CE, McKee GT, Kissin MW. The effect of needle gauge and local anaesthetic on the diagnostic accuracy of breast fine-needle aspiration cytology. Eur J Surg Oncol 1999 Feb;25(1):30-33. 2. Lannin DR, Silverman JF, Walker C, Pories WJ. Cost-effectiveness of fine needle biopsy of the breast. Ann Surg 1986 May;203(5):474-480. 3. Langmuir VK, Cramer SF, Hood ME. Fine needle aspiration cytology in the management of palpable benign and malignant breast disease. Correlation with clinical and mammographic findings. Acta Cytol 1989 Jan-Feb;33(1):93-98. 4. Jackson VP, Bassett LW. Stereotactic fine-needle aspiration biopsy for nonpalpable breast lesions. AJR Am J Roentgenol 1990 Jun;154(6):1196-1197. 5. Radiation Isotope Center Khartoum (RICK). Sudan. Medical records 2006. 6. Bancroft JD, Gamble M. Theory and practice of histological techniques, 5th ed. Churchill Livingstone, London, 2002; pp125-139. 7. Ahmed HG, Idris AM, Ibrahim SO. Study of oral epithelial atypia among Sudanese tobacco users by exfoliative cytology. Anticancer Res 2003 Mar- Apr;23(2C):1943-1949. 8. Krishnamurthy SC. Aspiration cytology for clinicians and pathologists, 1st ed. Tata memorial centre, 1991; pp 14-24. 9. Fentiman IS. Making the diagnosis: In: Detection and treatment of early breast cancer, Fentimen IS, (ed). Martin Dunitz, Cambridge, 1990; pp 39-57. 10. Hamill J, Campbell ID, Mayall F, Bartlett AS, Darlington A. Improved breast cytology results with near patient FNA diagnosis. Acta Cytol 2002 Jan- Feb;46(1):19-24. 11. Romero Figueroa MdelS, Santillán Arreygue L, Olvera Hernández PC, Morales Sánchez MA, Ramírez Mendiola VL. Frequency of risk factors in breast cancer. Ginecol Obstet Mex 2008 Nov;76(11):667-672. 12. Filie AC, Simsir A, Fetsch P, Abati A. Melanoma metastatic to the breast: utility of fine needle aspiration and immunohistochemistry. Acta Cytol 2002 Jan- Feb;46(1):13-18. 13. Rao L, Kudva R, Rao RV, Kumar B. Extraskeletal myxoid chondrosarcoma of the chest wall masquerading as a breast tumor. A case report. Acta Cytol 2002 Mar-Apr;46(2):417-421. 14. Lieske B, Ravichandran D, Wright D. Role of fine-needle aspiration cytology and core biopsy in the preoperative diagnosis of screen-detected breast carcinoma. Br J Cancer 2006 Jul;95(1):62-66. 15. Wilkinson EJ, Schuettke CM, Ferrier CM, Franzini DA, Bland KI. Fine needle aspiration of breast masses. An analysis of 276 aspirates. Acta Cytol 1989 Sep- Oct;33(5):613-619.